My previous post about Q-dees (You can see it here: LINK) has a good traffic but I haven't update about Mr Pocoyo school progress. So today, I will share with you guys on what happened after Q-Dees enrolment. If you look at my fee calculation (in my previous post), you'll see that annual fee for one kid is approximately RM4400.00 and this is for half day (up to 12pm Mon-Fri), which means if you are enrolling your kid for learning and daycare, you'll have to pay more. For family who has few kids and in the category of middle income, this is pretty expensive. When my kid was in Q-dees, he was 4 years old and he studied there up to November 2013. 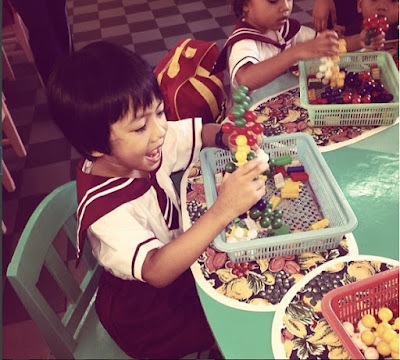 In 2014, he was 5 years old and we felt that he supposed to be enrolled in the school which is bigger just like a normal school to avoid culture shock when he's entering Year 1. The fact that there's no small primary school in KK with only 2 or three blocks, unless he's going to the International School made me realized that small school like Q-Dees wasn't what we wanted. All the Chinese public schools in KK are big, and the one that we planned for his year 1 is even bigger than some of the high schools. Anyway, it seemed like we had no other choice because we always want a good school with complete facilities and most importantly it is close to our house, and school with proper carparks is always the main thing to be considered. Anyway, the kindergarten that we chose wasn't the nearest to our house but still convenient enough for sending and pick-up, and the happiest thing was his favourite cousin Ah Boi was one of his classmates. Fast forward to December 2013, we successfully enrolled him in TADIKA TZU YU, I was touched and so thankful that the school administrator happily placed them in the same class. Bless her! Tadika Tzu Yu is one of the oldest kindergarten in Kota Kinabalu, a very well managed kindergarten, although the furnitures in the classrooms aren't new but that pre-school is humongous. It has everything that most parents could expect for. For graduation or concert nights, unlike Q-Dees, it has its own hall inside the school compound. 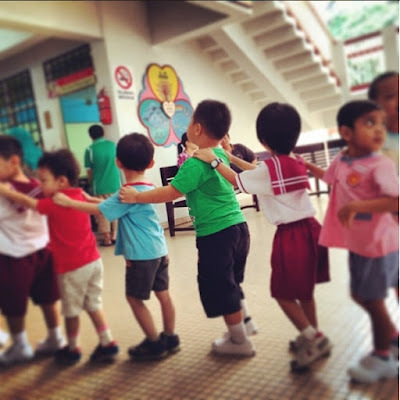 The kids will have their assembly in the hall, for PE (or PJ - Pendidikan Jasmani), it has a huge designated area, even if it's raining, the kids can have games in the gigantic hall. Awesome! And... just like the primary school that we've pre-selected, this pre-school school has a huge carpark. Our son completed his 2 years pre-school in Tzu Yu and it was good. We are so grateful cause everything was fine when he was schooling there. This was during their orientation day. He was very happy. They were going to the school surrounding, still during the orientation day. Year 2014, it was RM190.00 per month. That mentioned fee does not include after-school care. They do have after-school care program and during that years, it was like double of the halfday day rate. So if your here in 2018, the price maybe RM210. I'm just guessing. If you have any question about Tadika Tzu Yu, feel free to comment below. Thanks for dropping by!! What great piece of writing. Hi.. you enrol ur son when he was 5 yrs old right? not too late bah kan change school at this age? after i read ur qdees review and from others makes me think twice.. i havent decided to move him to new school or not, planning to when he is 5 years old but afraid if it will be tougher for him coz not exposed to 4 yr old punya class.